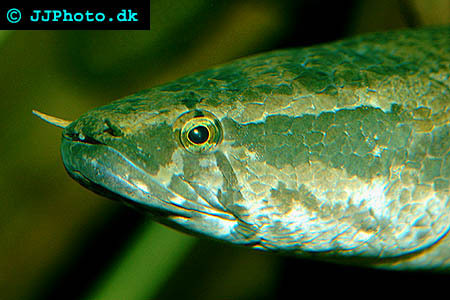 Company: Parachanna obscura (African Snakehead) should not be kept with fish smaller than 2/3 of the species size. 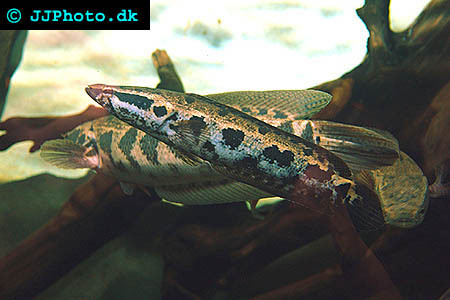 Aquarium setup: Parachanna obscura (African Snakehead) should be kept in large aquariums. The aquarium should be decorated to mimic a floodplain. There should be plants present but the number of plants should be kept down. Use rocks to create a few hiding places. Parachanna obscura (African Snakehead) can tolerate low oxygen conditions in water because they are air breathers from an early age. When prevented from surface access, adult snakeheads will die due to lack of oxygen. Feeding: Parachanna obscura (African Snakehead) will accept all live food and often frozen food. Breeding: Parachanna obscura (African Snakehead) guards their young but there are little information on how to trigger breeding.